MV MARINA readying for float out at Sestri Ponente. Sestri Sisters: A Float Out at Fincantieri’s near Genoa-based shipyard for the newbuilding MV MARINA and steel cutting for her twin, the MV RIVIERA. Ah, Genoa! I was delighted to be back in the Ligurian maritime capital once more, this time with the added treat of visiting Fincantieri’s Sestri Ponente yard to see Oceania Cruises’ splendid new MV MARINA. In just a few days, the structurally complete prototype of the company’s new 65,000 gt class of vessel would be ready for floating out of her graving dock to spend the next ten months fitting out. I was part of a group of cruise and maritime journalists and travel partners scheduled to visit the ship the following morning. In order to begin this blog, I had to finish off the last one, so had a dilemma of time on my hands. 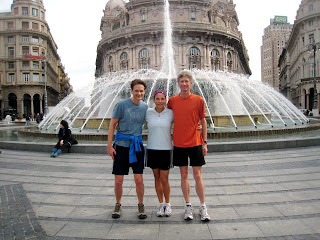 I also needed some exercise to get the blood flowing and brain working, so could not resist when fellow jogging journalist Johanna Jainchill of Travel Weekly asked if I would like to join her and VP of Cruise Specialists, Greg Nacco, for a romp about Genoa. If I brought my little digital camera along, I would also be able to get some photos of one of my favorite cities for a future feature in Cruise Travel magazine, so it was a given. 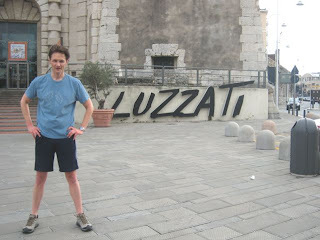 The only catch was that I was “leading” the jog and had no idea how to get from “A” to “B” in one of my favorite cities by the sea…. Please click on image to open a larger version. 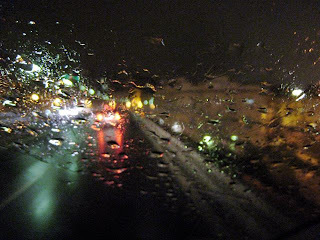 All photos and video clips by and copyright Peter Knego 2010. From our hotel, the Bentley (a wonderful black marble Mussolini Deco cube built in 1929), it was a short jog to a promontory overlooking the city. 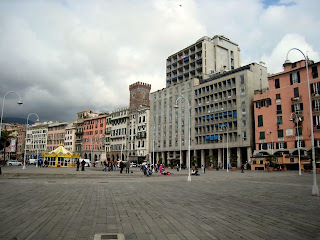 I wanted our promenade to encompass both the waterfront and some highlights of “classic Genoa”, so we began by taking the wide expressway down into the harbor, inhaling some fishy fumes at one point but otherwise enjoying a nice stride. 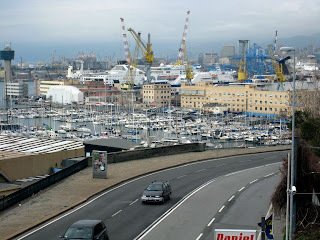 We next veered left toward the entrance to the massive Mariotti shipyard (where the ailing PACIFIC — ex PACIFIC PRINCESS beaconed), then along its perimeter to Porto Antico. Jogging by Luzzati. Photo by Johanna Jainchill. I paused to indulge my obsession with Emanuele Luzzati, Genoa’s late, lamented maestro of the arts. His work graced so many of the great liners and cruise ships of the twentieth century, much of it rescued from the scrap piles of Alang and now part of my home in California. The view from Molo Vecchio, Genoa. Onwards to the outer reaches of Molo Vecchio for a view of several large yachts, the harbor, and the mountainous pastel stucco backdrop of Genoa, itself. There could be nothing more invigorating than enjoying the underrated beauty of one of the world’s great cities with people who shared the appreciation. I’ll take Genoa any day over Florence, Venice, or even Rome. No tourists, a truly genuine, elegant setting and great food with the Ligurian coast (Camogli, Portofino, Santa Margherita, Rapallo, etc.) close by. After winding through a maze of streets and the aromas of bakeries, espresso beans and rain-soaked medieval stone, we found ourselves on Via Garibaldi, marveling at structures like Palazzo Rosso, designed by the architect Pietro Antonio Corradi and built between 1671 and 1677. It is now public property and contains a gallery with artwork by Van Dyck, Albrecht Dürer and others. 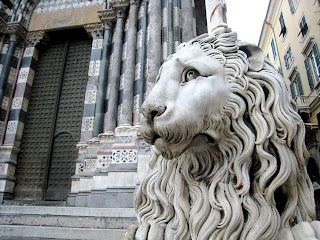 Lion of Genoa’s St. Lawrence Cathedral. Eastward along Garibaldi we trotted, then turned past the Opera House for a zig zag through tiny alleyways and cobblestone streets to a number of spectacular piazzas and cathedrals, including San Lorenzo, which was consecrated by Pope Gelasius II in 1118 and constructed and rebuilt over the next five hundred or so years. By the fountain of Piazza Ferrari. And a stop in spectacular, upscale Piazza Ferrari to ask an exchange student to take our photo before we moved onward…. 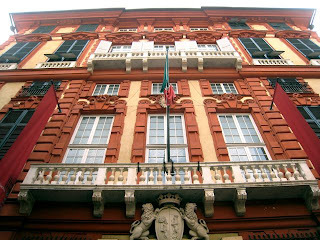 House of Cristoforo Colombo, Genoa, Porta Soprana backing. “Hmmm. 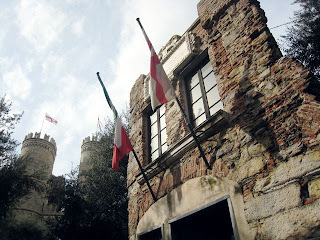 It must be here somewhere,” I wondered, as we passed underneath the twin Medieval towers of Porta Soprana. And then Greg found it, just where I last saw it, in a busy city square: the nondescript brick facade of Christopher Columbus’ home. Cervara, Abazzia di San Gerlamo, Santa Margherita Ligure. Our circuit ended fifteen or so minutes later, back at the Bentley. We broke for a quick pizza margherita and pizza melanzane combo across the street, then I returned to the room to write. 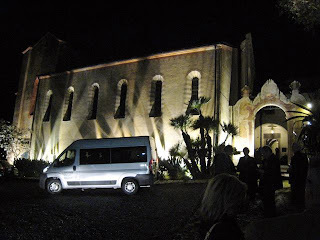 At 7:30 that evening, Oceania had a special treat for us with a gala dinner at the gorgeous Abazzia di San Gerlamo in Santa Margherita Ligure, within a stone’s throw of Portofino. And speaking of stones, this former monastery’s first stone was laid in 1361. Over time, the building was invaded, abandoned and finally declared a National Monument in 1912, having been restored by its current owners in 1990. 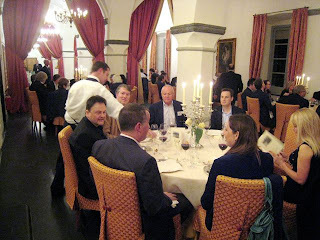 Dining in La Cervara, Abazzia di San Gerlamo, Santa Margherita. The attention to detail with which Oceania handles its spectacular events is applied even more stringently to the construction and operation of its ships. Our magnificent multi-course dinner was a perfect way to set up the following day at Sestri Ponente and the ceremonial “launch” of the MV MARINA. View Part One of the newest Sea Treks video, “MV MARINA at Sestri Ponente” and see the approach to the ship as well as tour a Penthouse Suite and a Standard Cabin. End of first post. Much more text, images and video to come….